There’s something special about a work of art unfinished. The viewer is able to study the methods of the artist, and observe their hands at work. Seeing a sculpture where its hinged or the lines that lead into an idea - it’s like being a botanist regarding a leaf with a magnifying glass. 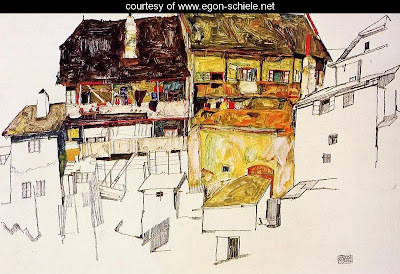 Egon Schiele is an artist whose body of work includes several unfinished pieces which are some of my favorite, like this one, of old houses in Krumau. Coordinators at Burning Life respectfully requested that observers refrain from taking photos of works before they were finished. However, as I watched builders at work today, I was enthralled by the amount of work that goes into building, which I could only appreciate by seeing each and every prim revealed. Seeing these builds in partial states made me consider the intricate planning it takes to build a structure, and, when a build is done right, it leaves the impression that it was a cinch to make. I crept around Donpatchy Dagostino as he worked today, watching from high above to below his feet, careful not to interrupt. 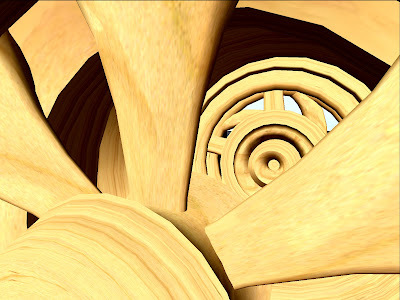 More than half is in a raw state, elliptical shapes awaiting textures, resembling, from above, the shell of a beetle. At this stage it made me think a little bit about artist-architects pushing the limits of wood, like Robert Harvey Oshatz. Dagostino’s intent may be better revealed once the structure is complete, but seeing it unfinished doesn’t make it any less impressive.